BRANDON, MB – A collection with more than 10,000 high definition maps is being moved into the John E. Robbins Library at Brandon University (BU), allowing for greater public access. The John Langton Tyman Map Library contains atlases and topographic maps of Manitoba and Canada, as well as maps from around the world. It’s one of only four official depositories in Manitoba for maps of the National Topographic System and National Atlas of Canada, and the only such library outside of Winnipeg. The collection is currently housed on the fourth floor of BU’s science faculty building. “The maps are used by many, including resource company field teams, hikers and campers,” says BU Librarian Betty Braaksma. “In addition to the collection becoming more accessible, the Faculty of Science will be hiring a map assistant, who will work in the library.” An attractive new study area has also been created in the Library, as part of the reconfiguration to house the collection. The John E. Robbins Library is the largest in southern Manitoba, with more than a million books, recordings and microfilms, including one of the world’s finest collections of Aboriginal literature; a comprehensive digital record of British newspapers 1600-1950; and the S. J. McKee Archives, featuring an historical repository for Brandon University, archival records related to rural development, education, agriculture, heath studies, and the City of Brandon, and several special collections including the Library of Manitoba Pool Elevators and the photographic library from CKX-TV. 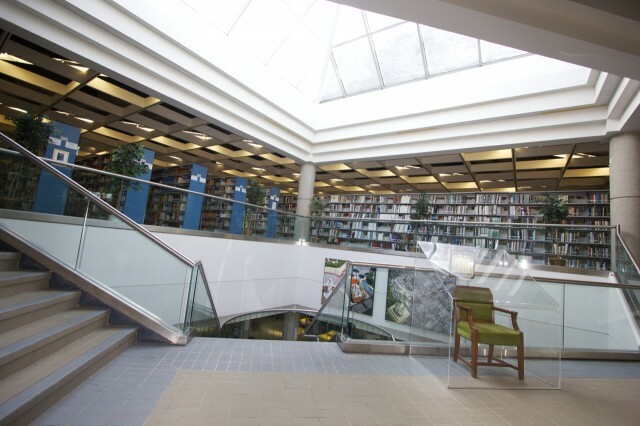 For more on the Library, please go to: http://www3.brandonu.ca/library/default.htm.